Does that taant saree in your cupboard see the light of day once in a blue moon? The ladies at Bomra Design Co. have taken it upon themselves to reinvent the elegance of taant in contemporary ways. Wearing a taant saree is quite literally like wrapping everything that is Bengal around you. 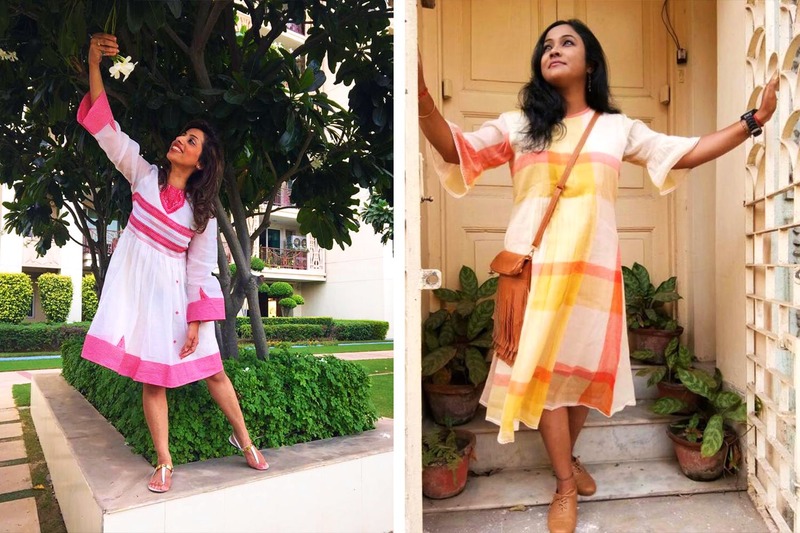 Kolkata’s Bhomra Design Co. is making trendy clothing from taant so even if a saree is not what you want to wear, you can still wear this magical Bengal handloom. Their collection includes Indo-western designs, super-stylish jackets, chic kurtis, tops, and dresses. It’s perfect for summer because it’s light and breezy. They also regularly set up stalls at different exhibitions around the country, not just the city. Their fabrics are the customary weaves of taants, dhakais, and tangails. They also have a men’s collection and a kids collection as well as home décor pieces are lined up for the future. Their prices are reasonable, starting from INR 1,800. Sriparna Ray Sengupta and the awesome Bengali ladies of her family are behind the label. The idea behind Bhomra (bumble bee in Bengali) came from the many different motifs that the weavers of Bengal often sought inspiration from. Each weave of taant, for her, tells a different story, some of the blue sky and stars, and others, of flowers and fishes. Her memories of taant go back to as early as her childhood, spent around her mother and grandmother, regular wearers of taant sarees.